This collection of modern crochet stitches is perfect for your next crocheted project whether it be a blanket, throw or afghan! Use the crochet stitch guide below to help you find the ideal but eye catching stitch for your next project! So many crochet stitches to pick from! If you have read my 5 basic crochet stitches for beginners post and are ready to try something a little harder then this list is for you. With so many crochet stitches to pick from this ultimate list of 31 stitches to try will be your last stop before making that next crochet afghan or throw! Read on down to find the packed list of step by step stitches so you can get started today on your next project! What are some Unique Crochet Stitches to learn? The question above was a question I always asked myself when I first started crocheting! I did and still to this day do end up using the simple but fun single crochet most of the time. The single crochet is still a favorite of mine for crochet patterns and can be extremely useful for beginner crocheters to master early! But once I researched all the different stitches I was amazed to find out how many unique stitches for blankets there really were! 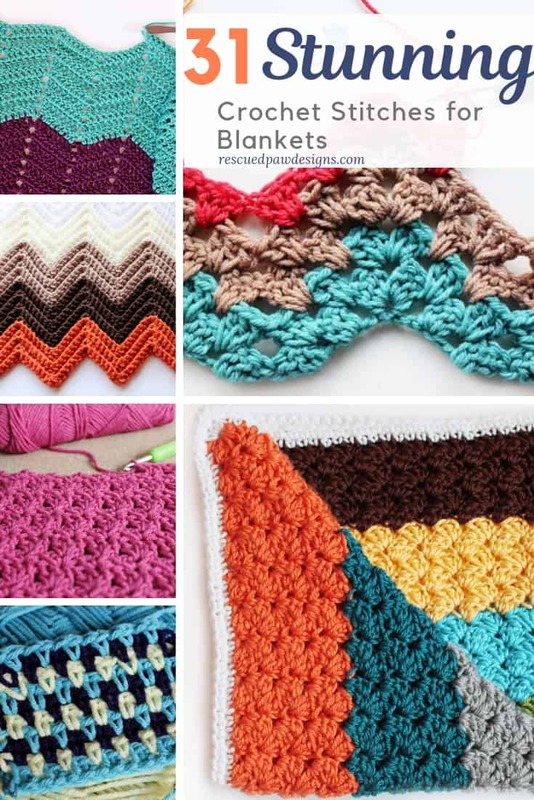 Try all these Gorgeous Stitches for Blankets Today! 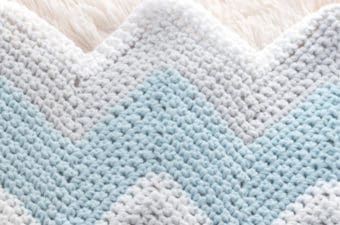 With the list below I hope that you will find some different crochets stitches to try on your next blanket or afghan that you haven’t tried before! Even if you still liked to stick with the single crochet stitch there are some great variations of that basic (but useful) stitch below that you may like to take a peek at. Most of the stitches have great in-depth photo tutorials, videos or simple step by step instructions to help you out. Before you get started you will need some yarn! Below I linked up some of my favorite go to yarns for blankets and throws. I do tend to shop mostly Lion Brand because of the amazing quality plus they are a great family company to support. Feel free to explore all the different types of yarns linked up and let me know which is your favorite. What are the best crochet stitches to use? Even to this day almost 5 years after starting this blog my go to stitch is the basic half double crochet stitch closely followed by the single crochet. I love basic simple stitches and design a lot of my blanket around them. 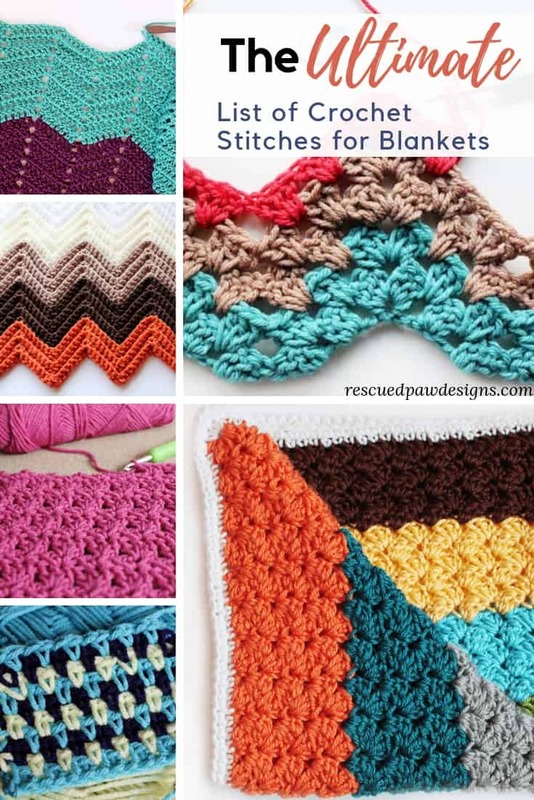 I usually use a combination of these stitches in most of my designs like the Single Stitch Chevron Blanket and the Blanket Stitch Throw Blanket. 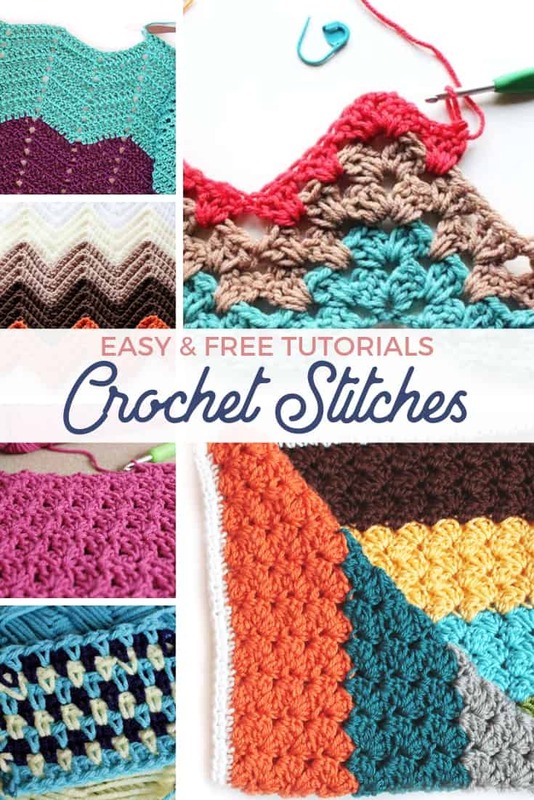 Now that I wrote about my favorite stitches read on down to find the huge list of crochet blanket stitches that are written out step by step and maybe learn some new crochet stitches that may become your favorite too! Happy Crochet Stitch Looking and please feel free to ask me any questions you my have! That’s it for this big list of stitches for crochet blankets! 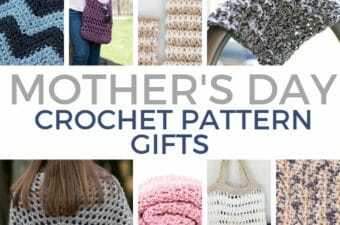 Please let me know which one is your favorite stitch pattern out of this list. 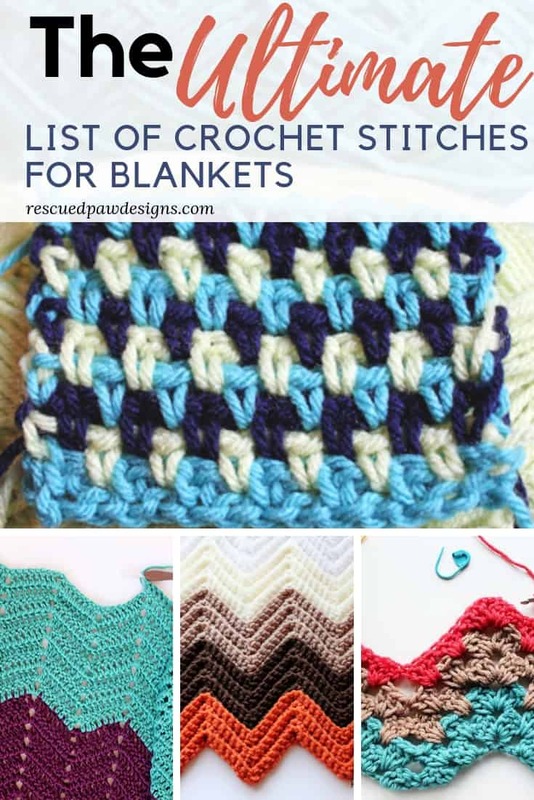 If you’d like to see my favorite ones then you might like this post about my favorite 7 stitches for blankets. If you have any more ideas of stitches that I missed then leave a link below so I can check them out! 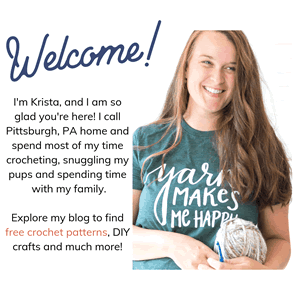 You can follow along with me on Pinterest (for even more free crochet patterns or on Instagram. (where I share my original crochet designs). Also, if you have any questions at all please feel free to email me at krista [at] rescuedpawdesigns.com. Thanks for being here to check out this list I put together! IMAGES & CONTENT: The images and content of RescuedPawDesigns.com are protected by copyright laws. Do not distribute or copy the content without written permission. Do not edit or remove watermarks from any original image from RescuedPawdesigns.com. If you would like to share an image, please only use 1 with a link back to RPD. Please use the original image with no overlays or additional text. IS THERE A WAY TO SEND ME ‘ 32 CROCHET STITCHES’ BY PDF? COST? THANK YOU. Hi Krista, would you consider writing up a pattern for a sweetheart afghan? I’ve searched for a pattern that incorporates a “heart” in the stitch ie… ‘v’ stitch, but cannot find one that is as clear as you write you patterns out I really like your page!! 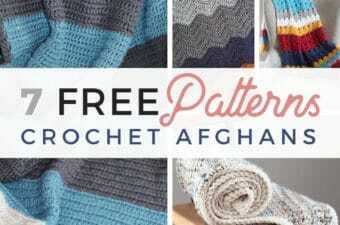 Thank you so much for your free patterns!! Hi! That is a great idea! I will add that to my list. Thanks Lisa! I will add that to my list! Thank you for the kind compliment! I really appreciate it! Happy Crocheting! I have enjoyed this site. I now know the name of some of the stitches I’ve been making over the years. Plus, I’ve learned some new stitches. I hope to visit often. Please keep sharing your patterns. Thank you.